You can find out the latest news here! Anti-bullying week is fast approaching! I spent some time a while ago emailing some schools and so on to see if they would mind me talking to their students about bullying. None of them got back to me - meh! In the mean time, I've been, with the help of the publicity department at college, doing various stuffs for my website. I have done 3 radio interviews - Radio Sheffield, Real Radio and Trax FM. I've made a few minor adjustments to the site. One of the larger ones you may have noticed is that I changed the background colours and so on. Other than that, it's been small things like adding sentences here and there and deleting things that... well, lets say things that don't make sense. I forgot to say also, ages and ages ago I did an over-the-phone interview for a book by Polly Clarkson. She writes real life book type things and the one about bullying will be published sometime at the beginning of 2008. Will let you know when that's available. What else? Oh, I found my Calendar interview from 2005 on tape *cringe* I'm going to send it to the friend who put the GMTV interviews on DVD (when I remember, that is) and get it up on YouTube. Thats all for now! A friend kindly put my GMTV interviews on a DVD for me and sent them to me in the post. After much faffing about and technological research and converting stuff, i managed to get them on YouTube. Click here for the LK Today interview, and click here for the live interview (6am... 6am!!!) for GMTV. I did a short over-the-phone interview for Real Radio this afternoon. It was basically to give my views on the fact that people are posting videos of teens being beaten up or bullied on online video sites, such as youtube. A piece of it should be played along with news on the hour, every hour, for the rest of the day. Way back in 2005 when my website first opened (wow, that was AGES ago!) I wrote a letter to Amber Hall, a girl who had been a victim of happy slapping. I did hear back from Amber; not long after I sent her a letter she replied. I wrote back straight away but she never replied. The reason she didn't reply was because Amber and her mother have been on the run for a while now, and they had moved house again and didn't tell anyone of their whereabouts, including Ambers father, who is currently living in America with his family. They are desperate to find Amber again, and have so set up a website in the hope they will find her. The website can be found at http://www.lookingforamber.com. Go take a look, the website explains more of what has happened over the recent years. There's a contact page on there, so if you know Amber or her mother, tell them about the website or sign the guestbook on the lookingforamber website, or alternatively email either of the people listed on the contacts page. Amber is missed very much by her family in America, and any slight information could lead to finding Amber and refilling the hole in Amber's dads life. So, if you have information, do get in touch. Wow, I haven't updated for ages! Saying that, I haven't changed anything on the website. I'm gonna add a new photo of me to the "About Me" page after I've posted this though. The website is totally... dead, so advertise, please! *tumble weed blows past* Stick the URL in your personal message on MSN and tell your friends about it ;-) It's getting lonely on the forums all by myself :-( But yeah, everything here is fine at the mo - have finished college now, so looking for a new job so I can keep a structure to my day (seeing as most days seem to be pyjama days just lately) and looking for some more voluntary work, seeing as i haven't done any for AGES (woops. Though I did get my certificate from MV for 150 hours voluntary work). So yeah, thats all, really. Something about my website printed in Bliss magazine, along with a (very horrible, shiney faced :-|) photo. Anyways, click here to go look. Not particularly site news, but I feel it's neccessary to write this here. My mum passed away yesterday morning. A few weeks ago she was diagnosed with ovarian cancer. We thought everything would be okay, it was treatable etc. and she would be fine. It wasn't that that killed her. It was complications with her kidneys, but it was linked with the cancer and the treatment and so on. It has come as such a shock to the family, we weren't expecting it at all. I know my mum was very... proud of my website, which is why I feel I had to write about this - I think she checked my guestbook more often than I did (but then again, let's face it, I dont check it that often anymore). So yes. Everything is all over the place, as you can probably imagine. Adding to the dedication on the first page. You know what I did tonight? I scanned the articles from the FreePress from Nov 2005, and Love it! from Feb 2006! So, yes... here they are. FreePress (methods of self-harm and address removed. Its a bit small, sorry!) Love it! Yesterday was the photoshoot for Bliss. It was really cool. There were four of us, and the other three girls were very lovely. The house where the photoshoot took place was fab, and the room we did ours in - WOW! And I thought my bedroom was pink! Anyway, that should be in the June/July issue. They will be including the link for my website so fingers crossed it will liven stuff up a bit. I received a copy of the interviews from GMTV (and they are mortifyingly embarrassing!) but they're on a tape so I'm not quite sure how I can get them onto the computer. If you know how, without the need for some silly technical equipment, let me know! Wow! What a fantastic busy week I've had! Left for London on Monday (nearly missed my train... but that's a whole new story) Did some filming down by the River Thames when I arrived (the hotel was fabulously posh) On Tuesday it was the filming for the Lorraine Kelly show, which went quite well (I think. I haven't seen it yet!). Stayed with my sister on Tuesday night and was in the train station on Wednesday when GMTV phoned again to see if I'd like to go on the main show today. Silly me agreed, so stayed in London for another night. As you can imagine, I was very nervous. The tiredness kind of cancelled out the nervousness (well, wouldn't you be tired having to get up at 4.30am?!) so was calm compared to how I was on Calendar in 2005, which is strange really, as Calendar is just a Yorkshire programme, whereas GMTV is the nation. *shudder* Scary thought! So that was at 10 past 6 this morning! Lorraine Kelly was on between 8.30 and 9.30, the interview was shown at 9ish. Gemma, the researcher from LK Today is going to send me a DVD with both the interviews on (so I can cringe at them) so will try get them on the website. But yes, its all over now. Just waiting to hear some information about the Bliss photos so I can do it all again! (Well... not again, cos its just a magazine and not TV. You know what I mean. Eurgh. Hush Sarah). Hurrah! Last night was the Spirit of Doncaster. It was a lovely evening, I really enjoyed it. I didn't win, but the girl who did win deserved it. Here's a pic. I was mid-blink, but unfortunately its the only photo I have! Clicky click! I got a letter in the post today inviting me to the final of the "Spirit of Doncaster". I made it to the final four out of 83 young people! It's on the 23rd November at the Mansion House in Doncaster. Will keep you updated. Tonight I'm going to an awards presentation for the "Spirit of Doncaster". It's the Young Persons category and it's just a small presentation for all the Young People in Doncaster who have been nominated for this particular category. Should be fun :-) Someone from the youth service nominated me purely based on my website and the work I have done with Millennium Volunteers and how much I've changed since I've been an MV. Today is my websites one year anniversairy. I never thought at all that I'd help so many people. I've had so many people emailing me to say thank you for the information on my website, and lots of people emailing to ask me for help. I've met some absolutely fantastic people through this site. With over 2500 visits, I hope my website has managed to provide people with the same help so many websites provided me with in the past. I got my GCSE results today, which I am pretty happy with. I got one A, 8 B's and 2 C's overall. See, I didn't let them ruin my education :) They controlled my life for long enough -- It's about time I take control now. I did an interview for Real Radio this afternoon. They are running an internet safety campaign over summer, so I was asked to talk about internet bullying and the effects of bullying. Not sure when it's gonna be played, but i will link to the site when the interview is on there. I had an article in Love it! magazine today. The article was about a page, with pictures and stuff. I have typed the article up so if you wanna read it, email me and I can send it to you. My mum picked me up early from school today. She said someone from Calendar news had phoned, and they wanted me to go on the show! I agreed to, im really excited :-) The video camera man has just left my house, he's been doing shots of my website. Someone is picking my and my mum up later to take us to Leeds to the Calendar studio to be on the tele tonight at 6. Also, Real Radio have just phoned, and they're on their way to do an interview for the radio. Is so exciting! So much has happened this month, hasn't it? I got home from school today to discover the newspaper I sent the letter to had phoned me! I wasn't in, so i dont know what was said, but my mum wrote me a note. 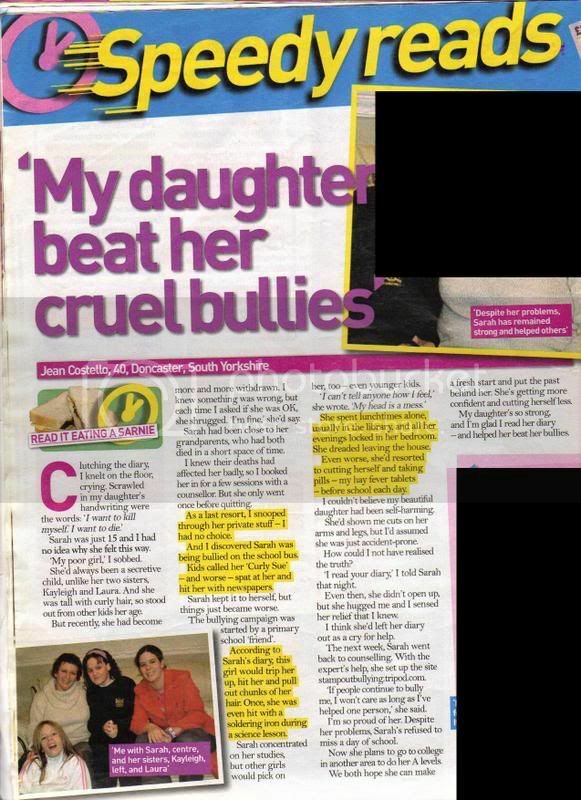 She said a man had phoned, saying he'd recieved my letter and he wants to do an article on me to raise bullying awareness! How great is that guys? Im so happy! I don't know whether im going to do it yet: the risk of everyone at school finding out about everything is scary. But im seriously thinking about it. Will let you know when i decide. Mentioning positive things I was impressed by your anti-bullying website. It seems to me that you have invested a great deal of yourself in terms of passion and care to highlight this dreadful condition that blights so many young peoples lives and to offer them help and support. You are to be admired and congratulated for your work and Connexions Direct is pleased to be among the resources you promote in helping young people with bullying. I read a story today in a newspaper about a girl who was a victim of "happy slapping" and was being bullied quite badly. I have wrote a letter to her and sent it to the newspaper in hope they will forward it to her. I hope they do! This website was officially opened!